Moab, Utah is known for its soaring temperatures and desert scenery, but you won't have to worry about staying cool when you vacation in this park model home. 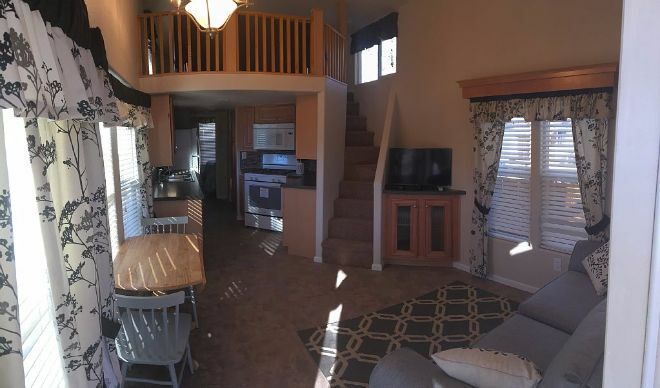 Edge of the Desert is offering a beautiful park model home as a rental on Vrbo for around $127/night. This kid-friendly park model has a spacious loft with carpeted stairs that are easy for your little ones to climb. The park model also includes not one, not two, but three flat-screen TVs (all with Netflix, Amazon Prime and Direct TV). 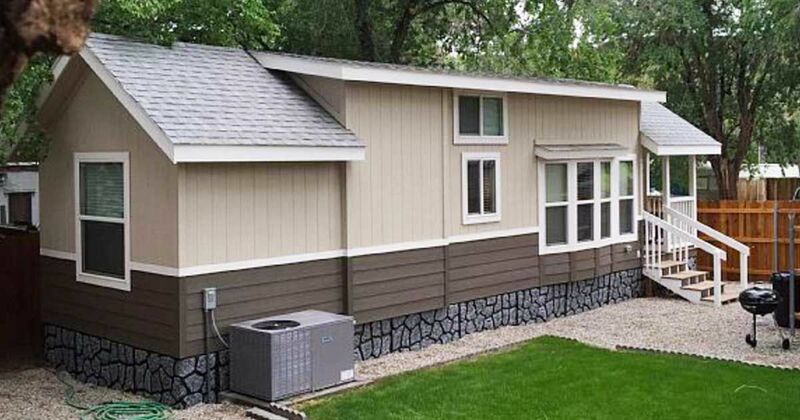 Whether you decide to veg out on the couch or explore the patio and grill area in the yard, this comfortable vacation spot has it all. 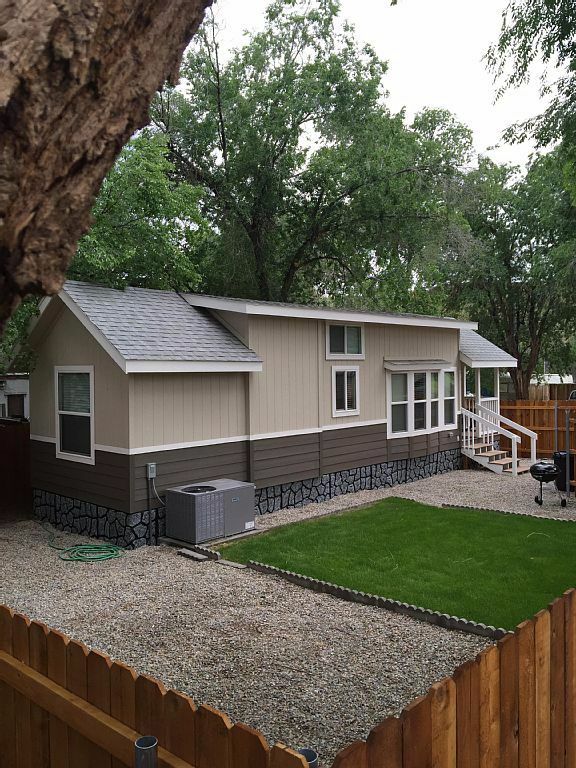 The backyard is pretty big for a park model property and includes a charcoal grill, picnic table and a nice 100 square feet (9.29 square meters) of grass lawn to relax and play on. 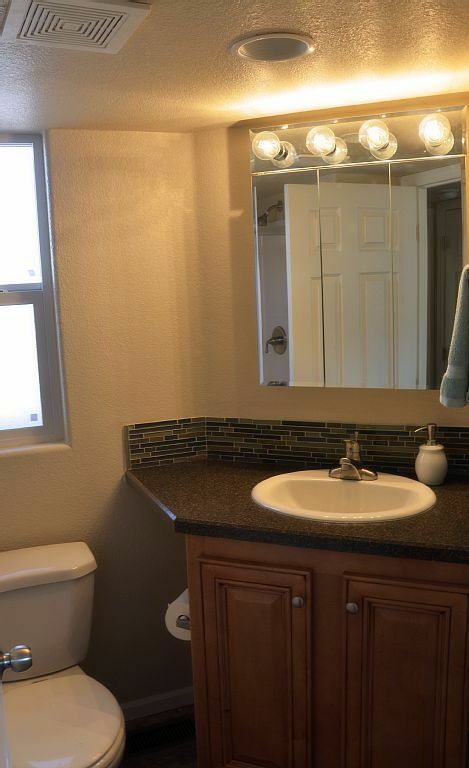 The décor in this park model is well thought out. Light touches of floral patterns and a tasteful area rug make this model just as cozy as home. The couch in the living room pulls out to become a single bed sleeper, while the loft has a simple, but comfortable futon. You can see just how high the ceilings are from this view. 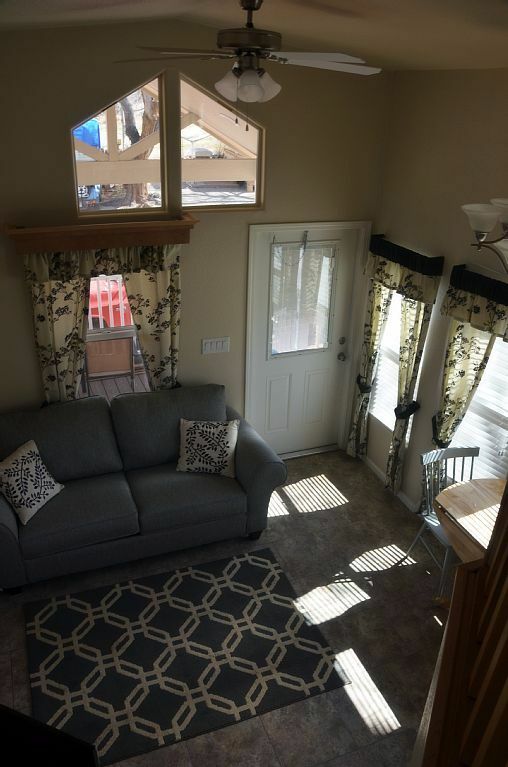 Aside from the ceiling fan, this park model also has central air and heating for year-round weather. Granite countertops and a playful tile backsplash are standard in the kitchen. 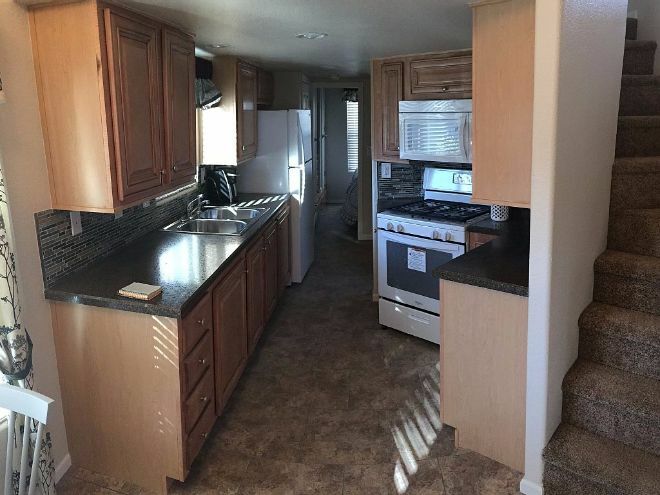 All standard kitchen amenities are included: a double sink, microwave, stove, refrigerator, and loads of storage cupboards. The dining area is small for a family of four, but the weather is nice enough that eating outdoors is more appealing. Down the hallway is the master bedroom, which features a queen bed and one of the flat-screen TVs, as well as two his and hers lamps and nightstands. The bathroom has a large sink and a shower with a fully-functioning ventilation system. Cooler evenings can be spent lounging on the front porch as you watch the sunset hanging over Moab's sprawling desert. It's a picture perfect luxury park model that you can make your go-to vacation spot for future stays.